The feature consists of three pipes made from polished stainless steel. It is supplied complete with pump and can be installed in a pond or pebble pool. The feature is hard wearing and comes with a 12 month guarantee; clean with a stainless steel cleaner. Do you need a reservoir? The price includes the feature and pump only. It does not include the reservoir shown in our picture. Unless you are putting the feature in a pond, you will probably need a reservoir. We can supply either a brushed stainless steel bowl designed to sit above ground or a 100% recycled plastic reservoir designed to go into the ground. 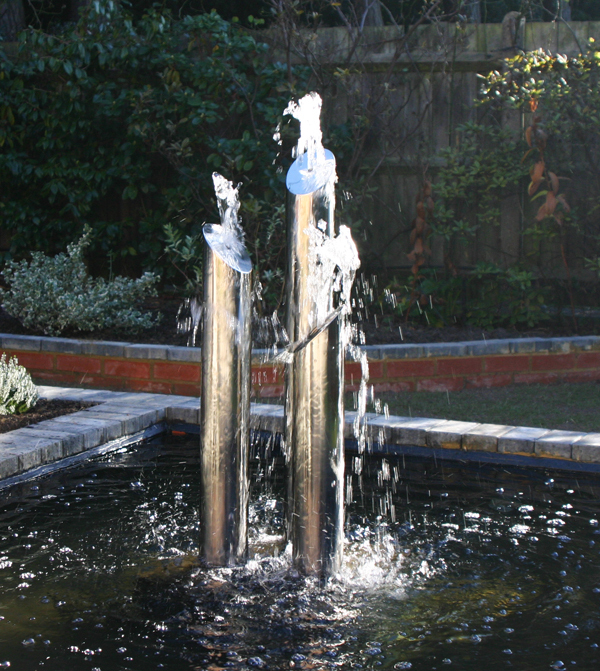 Our water feature will stand alone in the stainless steel bowl on concrete blocks provided. Thanks to Mr H for these great photos of the 90cm tubes in his garden pond. 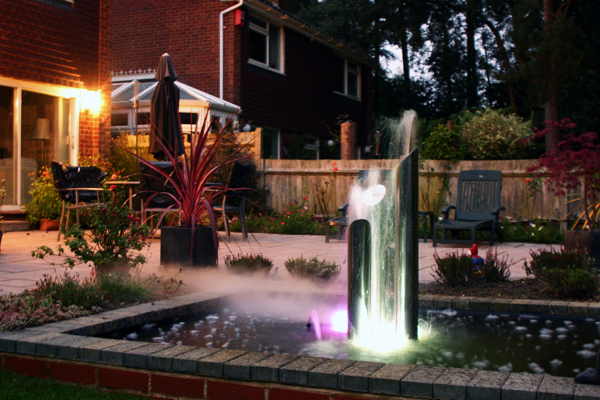 He's also used some of our water feature lights to create a wonderful night-time sculpture. "Good product, sturdy and came with all the fittings I needed. Successfully installed!" "Not up and running yet but the quality looks very good"
"Excellent service, ordered Monday, delivered Tuesday. All queries were promptly answered and information provided was very helpful in reaching decision to select Avon Tubes for installation in our new pond. Feature now installed and enhances garden. Highly recommended, both Primrose and Avon Tubes"